Wearable technology has rapidly moved from fantasy to geeky fad, and is now shaping up to become the next big wave after tablets. Many scoff at Google’s Glass but, judging from this year’s string of product and platform announcements at Consumer Electronics Show (CES) and from Apple, Google and Samsung, wearable technology is set to be the next major wave of consumer electronics. Indeed, research firm ABI predicts that by 2017 the market for wearables in the sports and health sectors will grow to nearly 170 million units. The smart glass industry? ABI predicts a $6 billion dollar opportunity by 2018. While the skepticism over Google Glass continues to rise in the media, the notion of “smart glasses” is gaining traction in many different professional and clinical settings. Every new med student at University of California Irvine received Google Glass to aid in information recall. New York-based developers Vuzix have created smart glasses for industrial applications, demonstrating that these new technologies are “well suited for a variety of industrial, medical, retail and prosumer applications.” Vuzix glasses run on the Android operating system and the unit and display fit over the wearer's right ear and eye. It can both record and playback video as well as take photos. Most exciting of all is Google’s new partnership with Novartis to bring smart contact lenses that would use tiny sensors to monitor glucose levels in one’s tears to the market. Google is also developing miniature LEDs that would indicate current glucose levels. This illuminates the possibilities for wearable technology in the healthcare industry, and how it might be used to manage chronic conditions and encourage users to take a more active role in managing their health and healthcare. One of the hottest trends for wearable technology is fitness and personal health. While the Apple EarPods turned out to be a hoax, LG announced that it will, in fact, bring its version of the biosensing earphones to the market. Using PerformTek sensor technology, these earphones record one's pulse and oxygen consumption. They can even playback the user's heartbeat as an audio track through the earphones, which is believed to motivate users and further enable them to control their breathing and heart rate. It doesn’t stop at the head or wrist either. Washington-based wearable technology developers Heapsylon have developed Sensoria smart socks which are made with conductive threads that function as sensors that monitor three pressure points on the foot as the user exercises: the heel, the big toe and the little toe. The data is then compared against external conditions such as temperature, topography and terrain, and transmitted to the user's smartphone via Bluetooth. Based on this data, a 'virtual coach' app gives users advice on how to improve their technique, get the best results out of their exercise, and avoid injury. In a similar vein, apparel maker OMSignal has a biometric shirt that can track everything from heart rate to respiration rate. Paired up with the companion iPhone app, it can even tell you when you need to calm down. The beat goes on, with Sony and Samsung also announcing major wearable and health initiatives. And all of this was announced before Apple unveiled its health-based API HealthKit and companion Health app, which is sure to spark even further development. All of this hardware is relatively worthless without software that actually improves the lives of the people wearing the technology. There are already plenty of digital pedometers in your favorite appstore. With major investments in health-enabled platforms, more developers will be enticed to build for these devices. What they choose to build will ultimately determine the value of the wearable the app runs on. Developers should look beyond the mere collection of biometric data to enabling the use of that data by health professionals and consumers alike. By making the data accessible and part of patient care developers will create far more value for the end user over building another calorie tracker. Making this leap from data collection to empowered consumers managing their health is what will fulfill the promise of the wearables boom. It can only be made possible by developers. But to do so, developers will have to learn the new ropes of patient privacy and regulatory compliance that dominates the healthcare industry. From ensuring HIPAA compliance for mHealth apps that transmit data to and from healthcare providers and patients, to ensuring that data is encrypted and safe on easily lost mobile devices; there are a host of challenges that need to be accounted for prior to diving in with app development. While it’s uncharted territory for most developers, it shouldn’t stop them from pursuing the opportunity. Where is All of This Data Going? Along with all of this new opportunity for new applications comes the associated concern of where all of this sensitive health data is actually going. And rightfully so: personal health information has a high black-market value, which makes it an enticing opportunity for hackers. Even ethical use is a concern for privacy advocates who worry how the data will be used by health providers and insurers. Deemed Protected Health Information (or PHI) by the law, the data is subject to compliance standards that require application developers who wish to play an active role in collecting and sharing data between user and doctor to go far beyond the current standards of most consumer health applications and wearable technologies. For more detail on whether or when health apps need to be HIPAA compliant, see our Developers Guide to HIPAA Compliance on Github. New solutions are emerging that help developers ensure their apps are HIPAA compliant, by creating secure and HIPAA compliant services, storage and APIs that allow application developers and covered entity IT departments use a common, secure and compliant programming interface to pass data back and forth between their systems. 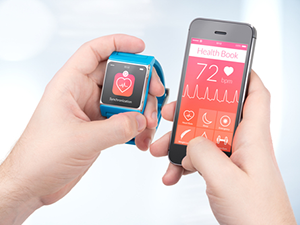 There is no question that the explosion in wearable technology will exacerbate tensions about the collection of personal data – especially the notion of lifestyle tracking to inform health insurance rates and other such decisions. It’s clear however, from the hundreds of millions of dollars that are being invested in wearable technology R&D through crowd-funding websites,, and the focus on health by major players from Apple to Google to Sony and everyone in between, that wearable technology already has captured the public’s imagination and is only going to get more pervasive. While we’ve focused on consumer applications of wearable technology here, the future is coming just as quickly in the professional medical world, where surgeons are already experimenting with Google Glass in operating rooms. The potential for smart glasses, smart watches, accessories, and the applications that run on them are nearly limitless. In all cases the use, sharing and protection of sensitive data will be paramount and an issue that all parties will need to address, from application developers to health providers and insurers, to the individual owners of these devices. As more consumers demand the ability to access and share their health information on these devices with doctors and other health providers, both application developers and device manufacturers will need to tackle the security and privacy issues that come with creating an easy to use consumer application that safely collects the health information that can help medical professionals improve patient care through data-driven insights—all while being compliant with patient privacy laws.